day 4089 – 254/365. getting ready to walk in the cashton fall festival parade! 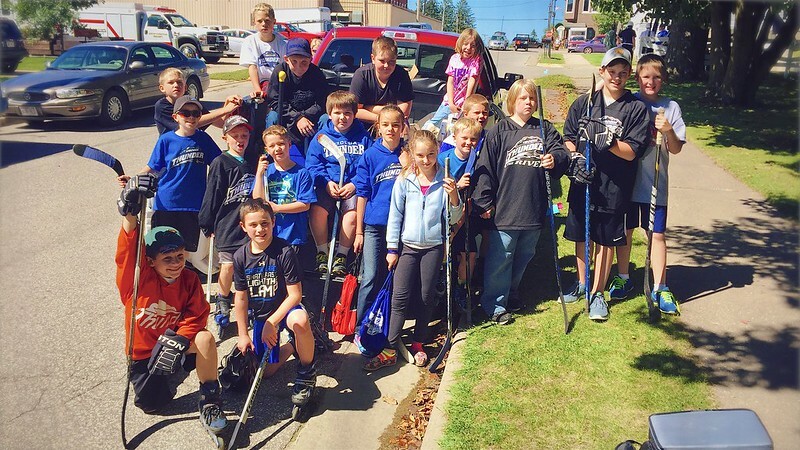 we walked with odin and some hockey buddies in a local parade to raise awareness for the hockey association. even though i’m losing count of how many parades i’ve walked over the past couple of years, i don’t mind since it’s all for a good cause. because i know a guy in marketing at organic valley, we had some organic fuel to hand out along with flyers and association swag. it’s always fun to hear an ever increasing number of people proactively yell out how much they love it. 156/365. new work digs under construction. some might recall that two years ago we had a fire at organic valley hq. the burned out portion of the building was rebuilt in a year but marketing has been old bank in westby, wisconsin for two years because there’s no room for us at headquarters. 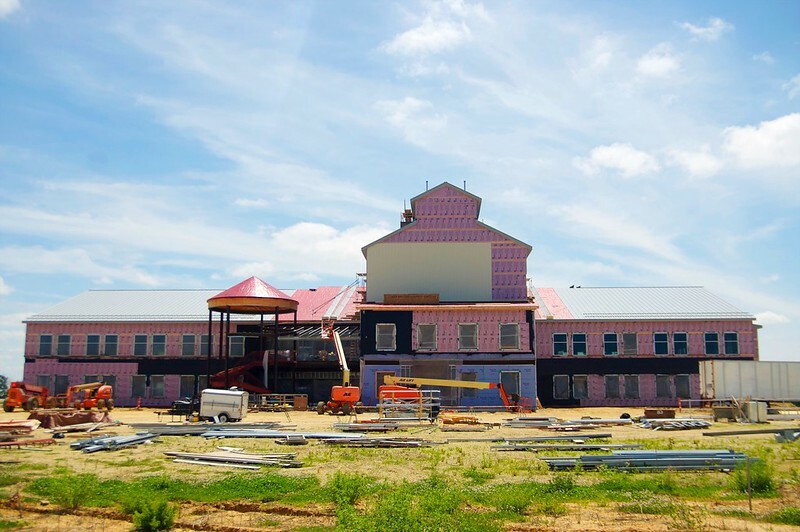 so, we’re building a new building in nearby cashton, wisconsin that’s coming along nicely. being in an old bank has been fine and all but can’t wait to move into the new building in early 2016! 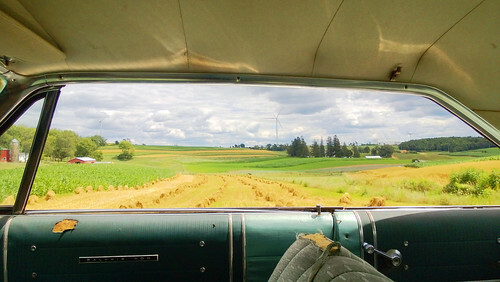 scenes from the galaxie: amish oak shocks and the organic valley wind turbines. the next step to getting right with the galaxie is taking her on a 60 mile road trip along the back roads of wisconsin to get a feel for how she’ll perform on longer road trips. driving down past all the pretty horses near odin avenue i noticed a nice view out the window of some amish “oat shocks” and the organic valley wind turbines and was reminded that 7 years ago i hatched a plan for a occasional series, “scenes from the galaxie”, while driving along the back roads of wisconsin to the upper peninsula of michigan. i think it’s still a good idea! i’m uh, torn, about fixing the tears in the upholstery. some might think they look shabby, but they remind of friendly lines of character on an aging, familiar face. all the pretty horses near odin avenue. driving back from hockey practice in la crosse with odin, south down county road pc ( aka “rollercoaster road” ) like we’ve done hundreds of times, we call out “hallo odin avenue!” as we pass by and then we pass by these three horses grazing near the road. 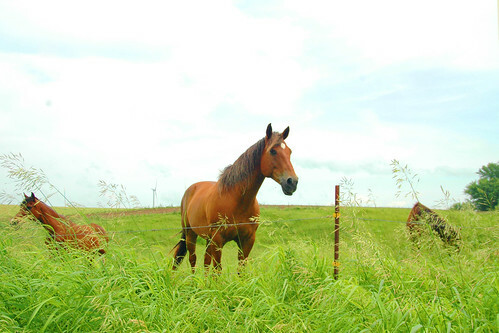 big and beautiful with manes blowing in the breeze and a hint of blue sky and almost too green pasture. if you look off in the distance you can see the organic valley wind turbines at our distribution center in cashton, wisconsin. i immediately get that feeling like i have to take a picture. if i don’t it will bug me for the rest of the day. but i don’t actually want to take the time to stop. the photographer in me argues with the part of me that just wants to get home and make dinner but i only make it a quarter mile past the horses before i hit the brakes. for him this is absolutely, completely normal if even a bit mundane. and as it happens, i couldn’t get all three horses to look up all at the same time and the wind had died down so their manes weren’t blowing, so it didn’t quite turn out like the shot i saw while i was driving by, but that’s the way it goes. earth, wind and fire. or, the sunnier side of biodiesel re-re-visited. it’s august which means it’s time for yet another photo of the high-oil sunflowers that are pressed for biodiesel for an organic valley sustainability program. some might recall my photos from last year and a few might even recall the original, popular sunnier side of biodiessel photo from five(?!) years ago. 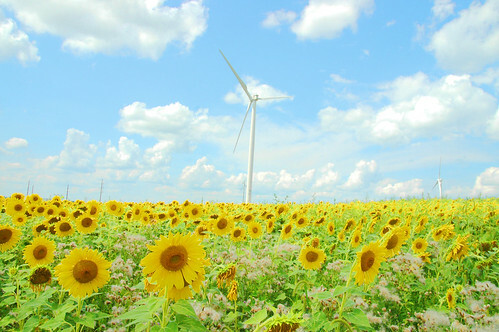 this year is extra exciting because nestled amongst the sunflowers you can now see the two wind turbines that are part of wisconsin’s first community wind farm that were put up in a partnership between organic valley and gundersen health system. the two wind turbines are expected to generate about 5 megawatts of energy which more than offsets organic valley’s cashton distribution center and our la farge headquarters. 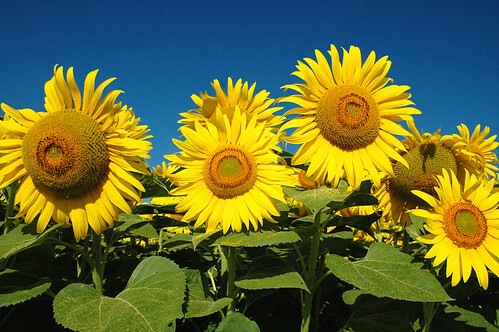 the sunnier side of biodiesel revisited. 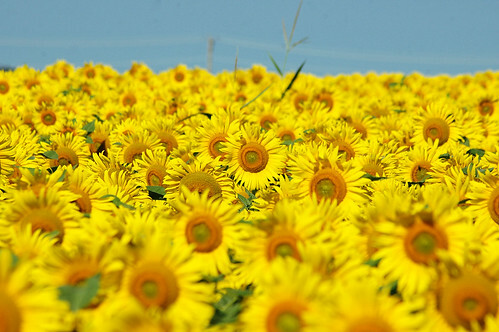 just a few photos of some of the high-oil, organic sunflowers suitable for use in the production of biodiesel. 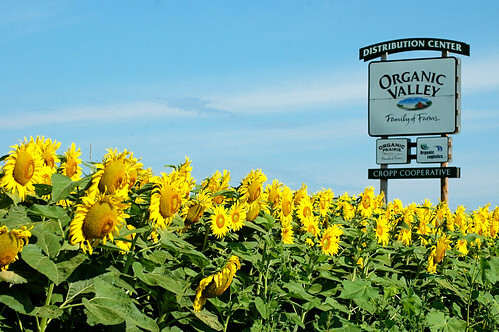 the field is owned by cropp ( organic valley ) and is near our distribution center in cashton, wisconsin. 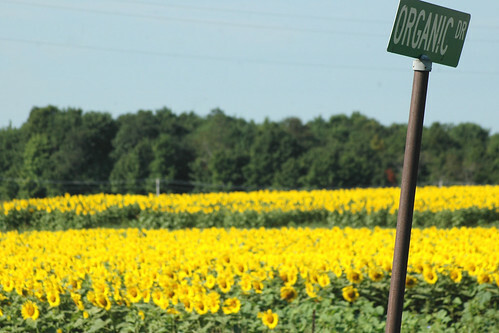 the sunflowers are part of cropp’s sustainability program ( you can view a few of my other sunflower pictures from years past on that page ). cropp farmers who plant on the farm benefit from the high yield of oil (80–110 gallons per acre) as well as the 1200–1500 pounds of feed meal per acre as well. we even have a mobile press that can travel to a farm and produce oil from a harvest ( yes, that’s another of my sunflower shots on the side of the press. ). feed and fuel from the same field! i believe this field will be converted to biodiesel to provide fuel for company tractors and trucks. i don’t really know why i haven’t uploaded more of my sunflower shots over the years, since folks seemed to enjoy the original “the sunnier side of biodiesel” photo. so, here you go internets! maybe someday i’ll get around to uploading all the other photos. trust me, you’ll want to view this panorama large, in the lightbox. i’m a little less pleased with this panorama, but hey, sunflower panoramas are like pizza. even when they’re bad, they’re good.